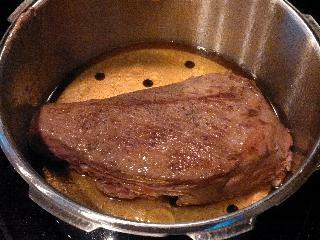 Using pressure cooker bottom (without rack), coat with olive oil and bring to high heat. 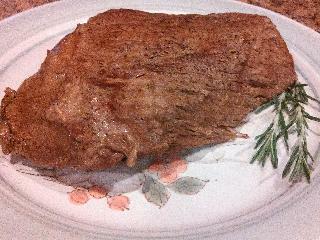 Once cooker is heated, brown roast on all sides using tongs to turn roast. 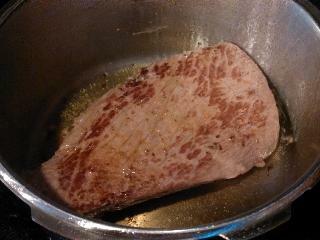 After browning all sides remove roast from cooker. Place cooking rack in bottom of cooker. Season roast with salt and pepper and place back in cooker. 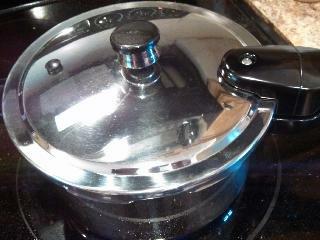 Pour broth or water into cooker. Place cooker lid on cooker and put on medium high heat. Bring cooker to pressure when regulator starts to slowly rock, then turn temperature to low and maintain pressure for 25 minutes. Remove from Heat and let pressure go down on its' own accord.